Sinkholes are a common naturally occurring geologic phenomenon and one of the predominant land forms in Florida. Many of the lakes in Florida are relic sinkholes. Sinkholes can be classified as geologic hazards sometimes causing extensive damage to structures and roads resulting in costly repairs. 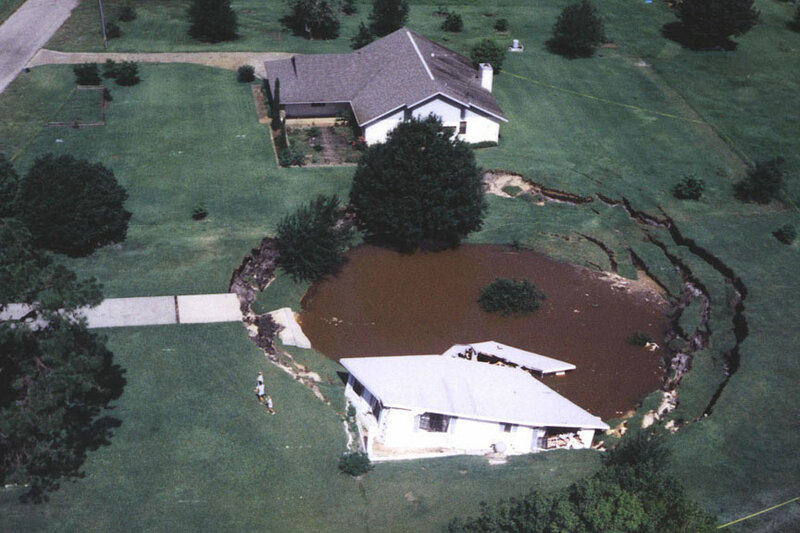 Sinkholes can also threaten water supplies by draining unfiltered water from streams, lakes and wetlands directly into the aquifer (underground water supply). What if a sinkhole opens on my property? If your home is threatened, contact your homeowners insurance company. If extensive damage occurs to your house or property, notify the Office of Emergency Management for the county. If desired, the resident may make contact with a private contractor to evaluate the hole to officially determine if it is a sinkhole. Consumer guides relative to sinkholes are available from the State of Florida Department of Financial Services. Sinkholes are depressions or holes in the land surface that occur throughout west-central Florida. They can be shallow or deep, small or large, but all are a result of the dissolving of the underlying limestone.